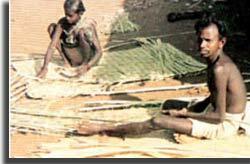 Khond Tribes are usually found in Bihar and are considered as the scheduled tribes. 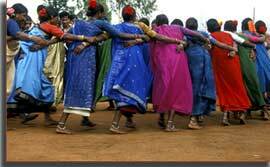 It originates from Odisha and is one of the major tribes of India. Khonds are also found in Andhra Pradesh. They are also called as Kandhs. The tribe is divided into many groups like hill or Kutia and Plain Dwelling Khonds. Male Khonds costumes generally includes Dhoti, Ganji and Shirt. The costumes of female include saree and salwar kameez, Dupatta. Khonds are very much fond of ornaments; they wear ornaments in neck, ear, finger, hair, nose, wrist and feet. They are made of bronze, shell, gold, brass, steel, nickel, seeds, thread and gold. They almost follow eighty three gods. Some of the Khonds follow Hindiusm and some follow Christanity. They worship the main deity Sing Bonga and the local deities namely Thakur Dei, Thakur Deo, Burha Dei, Burha Deo, Borang Buru, Bhagbonga, Tila Bonga. They also worship some of the popular gods such as Goddess Durga, Bhagwati, Goddess Lakshmi and Lord Shiva. The tribal community of Khonds belongs to the Anstro-Asiatic Family. Khond are hunter and gatherers. They go out for collective hunts eating the fruits and roots they collect. These practices make them mainly dependent on forest resources for survival. They have given their name to the Khondmals, a subdivision of Angul district in Odisha. The Khond language, Kui, is more closely related to Telugu. Khonds are very good at usage of medicinal plants and treat diseases with the plants. They are tall group of people who have some features of Aryans. They are divided into different clans like Hansa, Beck, Hembram, Bedia etc. They usually cook food with oil extracted from sal and mahua seeds. They also use medicinal plants. Their main language is known as a Kuvi which is a type of Dravidian Languag. The tribal people have separate village and they are too developed in adopting the occupations of hunting as well as cultivation. The festivals are occasions with great pleasure and enthusiasim. Khond Tribe celebrates festivals like Dussehra, Diwali, Sohraj, Sarhul, Jitia, Phagu Karma, Nawakhani and Ramnavami with great honour and pomp. The celebration in this tribal community are with lots of fun and truimph which includes music and dance with beating of Dhol, Kartal, Thali, Nagara and Flute. The rituals of Khond Tribes are very much pious which are reflected in their practices. In the ancient times the Khonds used to commermorate their Earth Goddess, Tara pennu, the practice of giving the living beings as a sacrifice. The religion of animism is followed by Khond Tribe. The first victim of Khond Tribe is Biharwas devoted, bought or captivated. He is then anointed with oil and turmeric and then connected to crosspiece of the pillar which has an elephant. Then the crosspiece is spanned and taken around the erected post. Men and women both dance and sing around the victim who are then narcotized and intoxicated. He is then beaten upto death and chopped into pieces. Then the Khond Tribes used those pieces and bury it into the fields to ensure that the crop is beneficial and debar evil. Ultmately this practice was prohibited in the year 1845. Today Khonds go for giving goats and buffaloes as offerings. Khonds economy is mainly dependent on agriculture and labour. Each family in the Khond Tribal Community owns some agricultural land, besides homestead land and Bari-land. Their agricultural land is two types- Don and Tanr. Don land has move water storage capacity so Jarhan or Agahani paddy are cultivated. Tanr land has less water storing capacity. So, Vadai paddy, maize, marua, Kurathi, Surguja, Til, Arahar, gram, etc. are cultivated in Tanr land. The cultivation in Tanr land is done by dry cultivation method, while in the Don land, cultivation of crops is done by wet cultivation method. There is no assured means of irrigation as they are dependent on rain fall . Nowadays, some Khond families have wells and diesel machine and they are attracted towards the cultivation of vegetable crops. They use Hybrid seeds, fertilizer and pesticides in the cultivation of the vegetables. The agriculture is generally not profitable, but they are able to grow paddy for their consumption. They are not in a position to sell the yield of the paddy because they do not have more yields. The agriculture provides them engagement only for 6 to 8 months in a year. For another 6 to 4 months, they are dependent on setting their labour as Reja, Coolie in the forest, field, construction site, brick kilns, mines, industries etc. But as labour, they do not get work regularly. They do not get minimum wages as fixed by the Government time to time.